The Single Most Valuable Task You Can Do Before Surgery – Practice, Practice, Practice! What… Exercises That Don’t Involve The Hip? Make A Deposit… In Yourself – There is a lot of emphasis on post surgery rehab exercises, but, to me, the most important exercises are those you do BEFORE your surgery. If you think about it, it makes sense – you are stronger, more mobile and even if you are in pain, still able to perform many of the exercises you will have to do anyway. And, as a bonus, your recovery will be faster. “It’s easy to talk about, it’s easy to sum it up when you just talk about practice. We sittin’ in here, I’m supposed to be the franchise player, and we in here talkin’ about practice. I mean listen, we talkin’ bout practice. Not a game, not a game, not a game. We talkin’ bout practice. Not a game, not a, not a, not the game that I go out there and die for, and play every game like it’s my last. Not the game. We talkin’ ‘bout practice, man. I mean how silly is that? We talkin’ bout practice… But we talkin’ ‘bout practice, man. What are we talkin’ ‘bout? Practice? The Single Most Valuable Task You Can Do Before Surgery – Practice, Practice, Practice! – It may not be necessary for Allen Iverson, but it is for you. I estimate that by doing prehab for the seven weeks leading up to surgery, I cut my rehab time in half. I used a walker for about three days after surgery, used crutches for ten days, used walking sticks for another week or two (mostly carrying them in case I got sore or tired) then I was walking, without assistive aids. Getting Old Isn’t For The Weak – Medical problems increase the older you become. Your must keep your body strength up to not only help prevent injuries but to also help shorten your recovery times. The book includes a list of all the prehab exercises I performed and I also included additional exercises, knowing what I now know, that I should have completed during my prehab. Don’t try and do prehab, just do prehab. Pre-Physical Therapy – One of the most surprising facts about a hip replacement is the minimal requirement of physical therapy. While in the hospital, the physical and occupational therapists will show you how use a walker, how to get into a car, how to use a grabber to get your clothes on and other simple tips. That’s it. Your post surgery physical therapy is walking plus leg and hip exercises. Hip Tip – Do Prehab To Shorten Recovery Time: I had my operation scheduled 60 days in advance and asked my orthopod to prescribe a meeting with a physical therapist to learn which exercises are typically tasked after surgery. At that point I could lift my bad leg about four inches off the ground. I received a workout list and I started doing those exercises, for 60 minutes every night, in front of the TV. I grabbed a dining room chair and used that for balance and did the leg exercises. By the time I met with my orthopod just before surgery, I could raise my foot off the ground by about 18” more than I could previously. Consult with your health care team before starting these suggestions. Prehab Starts Now (Yep, This Means You. Yep, This Means Today!) – It is hard to get excited about doing prehab. A lot of people say they want to ‘try’ and do it, but don’t. You just have to do prehab, it will dramatically shorten your recovery. Set up a schedule and stick to it. Start now, right now. I have provided a list of the prehab exercises I performed and then included additional exercises, knowing what I now know, that I should have completed during my prehab. These exercises may be too easy or inappropriate for you. Consult with your health care team before starting your prehab. Timing Is Everything – Most individual exercises can be accomplished in three minutes. I don’t know why, but my wife said I should already have an innate timer for exactly that period. No Special Equipment Needed – I used the floor, the couch and chair to do the following exercises. Do the exercises on both legs and hips so you retain equal strength and, realistically, if one hip is bad, the other probably isn’t far behind. This is a great start on strengthening the remaining good hip. Hip Tip – Obtain Expert Advice: Any prehab exercises or medical information is solely based upon my personal experience. Please seek the advice of your physician (as if I haven’t mentioned this before), physical therapist or qualified medical professional. Have your health care team approve of these exercises before you begin your regimen. You may have limitations set when using these exercises for rehab. Knee Raises – Place a chair in the living room, preferably in front of a good TV show. Hold the top of the back of the chair and raise your knee as high as you can (note that after surgery you will be limited in how high you should lift your knee). Standing on one leg, lift the opposite knee off the ground, then return it to just a few inches from the ground, never touching the floor. Do sets of 10/20/30 or whatever you are comfortable with. If this is too easy for you, you can do like I did and add ankle weights until it is a challenge. Always try and maintain normal posture as you work both legs. Moving Your Back And Forward – Grasping the top of the back of your chair, stand on your good leg, and slowly move your bad leg, straight-legged, back and forward. Be sure to that your hip, knee and foot are pointing straight forward while maintaining good posture. Be sure to exercise both your good and bad hip. Do sets of 10/20/30 or whatever you are comfortable with. If this is too easy for you, add ankle weights until it is a challenge. Moving Your Heel Up And Down – Grasping the top of the back of your chair, stand on your good leg, and then while bending your knee, slowly lift your bad leg heel up towards your buttocks. Be sure not to move your thigh forward. Step Ups – Use something solid and secure like a block of wood, a cement cinder block or your passed out mother-in-law and, using your chair for balance, step up with one foot, then back down. Repeat on your other leg. Step up normally and also step up using just your toes. Do sets of 10/20/30 or whatever you are comfortable with. Ankle Pumps – No this is not some new fashion footwear, it is a simple exercise to get your ankles ready for your new gait. While lying on your back, bend your bad hip ankle by pointing it your towards your hip, then away from your hip. Next, point your toes away from your body and rotate your ankle in a circular manner, alternating feet. To demonstrate your command of this exercise and your dexterity, also move your ankles in towards your groin and out, away from your body (you won’t be moving your operated leg inwards after your surgery). Do this for three minutes (about the length of a commercial break on your local news). Quad Sets – While lying on your back, straighten your leg, point your toes back towards your hip, then slowly tighten the muscles on your thigh for 10 seconds being sure not to bend your knees. Alternate your legs so that you retain equal strength. Do this for three minutes. Side To Side Leg Slides – Lie down on your back, and point your toes, perpendicular to the floor, towards the ceiling. Move your leg out to the side as far as possible. Repeat this process with your other knee. Slowly return to the starting position and relax. Do this for three minutes. Gluteal Squeezes – This is a typical exercise. No, a gluteal squeeze isn’t what happens when an inappropriate boss pinches a co-worker’s rear, it is an exercise to strengthen the muscles near your hip. Pretend you have a hard-boiled egg between your buttocks cheeks, then squeeze your muscles as tightly as possible for 30 second sets. 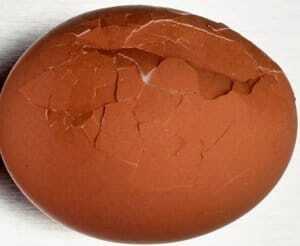 Throw away the egg when complete. Heel Slides With Leg Lift – Lie down on your back, preferably on your bed (the floor is too easy) so you can adjust to doing this exercise after recovery as well. Bend your knee upwards and then pull your heel toward your buttocks (be sure not to bend your hip more than 90 degrees when you do this exercise after surgery). When you heel reaches your buttocks hold for 10 seconds. Then left you knee up to strengthen your leg. Repeat this process with your other knee. Do this for three minutes. Short Arc Quads – Place a rolled towel under your knee. Raise the lower part of your leg until your knee is straight. Do this for three minutes. Stomach Pumps – No this isn’t like what happened to you that time you had too much alcohol. Lie down on your back and bend your knees. Squeeze and tighten your lower stomach by pulling your stomach towards your spine. Do this for three minutes. Quad Muscles – Lie down on your stomach with both legs on the ground. Slowly bend one leg, moving your heel towards your buttocks. Do both legs. Do this for three minutes. Be sure to use an elevated chair with armrests for additional safety and stability. If you don’t have an elevated chair, you can create one by adding firm pillows to a standard chair. Always practice safe hip precaution techniques. Arm Pushes – Sit down on an elevated chair with sturdy arms. With both feet flat on the floor, push yourself up mostly using your arms. As you do this exercise rotate so that use just one foot on the floor, then the other. Do this for three minutes. Sit To Standing – After you have mastered the Arm Pushes exercise above, sit down on an elevated chair. With both feet flat on the floor, use your legs to stand. Having your walker or another chair in front of you will provide safety in case you lose balance. Do this for three minutes. Thigh And Hip Muscles – Sit down on an elevated chair lift one foot, pointing your toes upwards, and proceed to the point where you can straighten your knee. Hold for five seconds, repeat on other leg. Do this for three minutes. What… Exercises That Don’t Involve The Hip? I know, I know – you thought we were only going to talk about hip exercise. Well, there is more to it. One of the most overlooked set of exercises are about your arm, wrist and shoulder strength. Once you have surgery you will be using a walker, then crutches and maybe a cane. Be sure do strength exercises before your surgery. Chunky Style – It can be as simple as taking two soup cans and using them as weights. Do bicep curls, raise your hands over your head and generally exercise your arms with a wide range of motions. If you need something more substantial, take a couple of empty plastic milk jugs and fill them with water to your desired weight. Swimming – By Far, The Best Exercise I Did – Of all the things I did for prehab, and rehab, there was one exercise that was by far the absolute best. I share this with you and the variations I added to improve my strength and range of motion. Swimming – The Arranged Marriage – I wasn’t really into swimming, but I went to the local pool and bought a two month pass. I bought two months so I would be forced to honor that commitment. The more I swam, the more I tolerated it. It soon became like an arranged marriage, that somehow worked out. My hip got stronger and I benefited – you will too. Hip Tip – Don’t Be A Wimp: I am not talking about going down to the pool and just getting in the water. The type of swimming I am talking about is getting in the water for at least 30 minutes a day and swimming as hard as your hip will allow. No wimps, no whining! Swim to the best of your ability – of course, get approval with your medical care professional before starting. 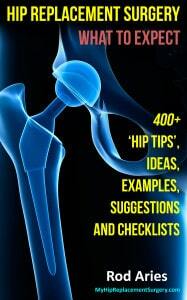 Hip Tip – Kickercise It: My goal was to really work my hip muscles. I took four kickboards lashed with a Velcro strap creating a large ‘kickboard block.’ I then put that block perpendicular to the water, to increase resistance, and kicked away. I would try and mix up my leg kicks with straight kicks, side-kicks, circular kicks, running motion kicks, frog kicks, lifting kicks – I felt like I was Mikhail Baryshnikov in the water, but I later overheard someone in the shower say that I was more like PeeWee Herman. I swam every other day, hard, for at least an hour. Hip Tip – Kickercise Book: I am completing a book called Kickercise. It will detail on the range of motion exercises you can do for both prehab and rehab with a swim kickboard. Hip Tip – Swimming Equipment Needed: You are probably a much better swimmer than I am, but these are the swimming accessories I bought: a Waterproof Apple iPod Shuffle , Swimmer’s Center (not side) Mount Snorkel , Kayak Nose Plugs (the normal nose plugs are too wimpy), Swim Goggles , Swimming Ear Plugs , Chlorine Removal Shampoo , swim fins and a ventilated swim backpack to hold all of it. The center-mount snorkel looks weird, but I was into swimming lanes, not the runway. I also swam after surgery, but it was several months before I could bend far enough to put on the swim fins. I have included links to all the related rehab swimming gear. Hip Tip – Kickboard Sizing: I suggest using one kickboard for each 50-75 pounds of body weight. This will provide both buoyancy and resistance as you swim. I Shoulda’ Done More, “I Coulda’ Been A Contender”- After the surgery it was evident there were glaring weaknesses in my prehab program. Now, don’t get me wrong, the prehab program was great and shortened my recovery time, but I found myself in more than a few physical predicaments that are common to everyone who has hip replacement surgery. The following is a list of exercises I should have done daily, even though at first glance they seem easy and, logically, don’t appear to require a daily regimen (but they do). Again, any prehab exercises or medical information is solely based upon my personal experience. Please seek the advice of your physician, physical therapist or qualified medical professional. Also note that, during rehab, most orthopedic physicians recommend to keep the angle between your leg and torso always greater than 90 degrees. Read the section on safe hip precautions and check with your orthopod for their guidelines. Flat On Your Back – Pushing Yourself Up, Off The Bed – I have exercised probably five days a week for that last 40 years. I thought of myself as a reasonably strong and fit person. The first night at home, after surgery, I was lying on my back in bed and finding myself thinking I was in one of those horror movies where the person in bed is grabbed through the mattress and pulled down by a monstrous being. It just seemed that even though I wasn’t moving, I just kept sinking deeper and deeper into the mattress – almost like in the top of sand draining hour-glass timer. Hip Tip – This Was The Most Uncomfortable Post Surgery Event That Happened To Me: The longer I laid there, the deeper I sank. I don’t normally get claustrophobic, but I had my wife open all the windows and patio slider doors to the bedroom thinking that would relieve the feeling of confinement. It is hard to explain why, but it just seemed like I was Velcroed to the bed, and sinking. Getting Out Of Bed With One Leg Unsupported – The exercise I should have performed was while laying on my back, without using any of my lower body, to push myself up with my arms and then use my arms to slide myself to the edge of the bed. Initially I found it amazingly difficult to push myself up with my arms as the angle, with my wrists and elbows lifting myself up, was made harder by sinking a bit into the mattress. Hip Tip – Leg Lift Exercise: It is hard to make a leg (hip) dead weight. For your prehab exercise, I might suggest taking an elastic bandage and a handful of wadded up cardboard. Put the cardboard on the bottom of your thigh as you tightly wrap the elastic bandage. Now, try and use your two arms and one good leg to get out of bed. The discomfort you will feel from the cardboard will simulate how weak you will be after your surgery. Once Is Not Enough – As simple and almost unworthy as it sounds, I should have practiced getting out of bed with one leg at least 10 to 20 times each day. I needed to build up my arms and core even more while getting used to this angle of pushing myself up. I would recommend doing it on the softest bed or couch you have to make it as difficult as possible. Keep ‘Clam’ And Carry On – Lie on your side. Slightly bend your knees and then imagine your knees are like a clam shell opening and closing. I should have done this exercise because after surgery this hip motion is where I was the weakest. Be sure to exercise by lying on both sides. Range Of Motion Exercise – This is a prehab only exercise. After surgery all the muscles associated with hip movement are going to be very weak and very, very sore. Additionally, you won’t be laying on your side very much. Also, you cannot have your foot crossing the centerline of your torso – which is not allowed during recovery. Having stated that preface, lie on your side and bend the bottom leg at a 90 degree angle, keeping just your thigh straight in alignment with your body. Your top leg is also kept completely straight. Raise your top leg towards the sky, hold it and then return to letting it rest against your bent bottom leg. Do this at least 20 times on both sides of your body. I Really Shoulda’ Have Done A Lot More – Having said that, I should have done this exercise, a lot, before surgery as this hip motion of is where I was the weakest. Simply lifting your straight leg up strengthens the inner thigh muscles. This ability to open your legs like this will be very hard to do after surgery. Hip Flexor Exercise – My hip flexors were extremely weak after surgery. Lie face down on the floor. Lift on leg off the ground and point your toes away from your body. Hold for 10 seconds. Repeat for each leg at least 20 times. I should of done many of these exercises. Alrighty… that concludes Chapter 15.